A few years ago I found myself having lunch with an ex-head of Revlon who commented that I had beautiful skin. Fast forward to last summer and things had gone totally awry. I had developed all these tiny little lumps all over my forehead. If you can imagine a balloon filled with rice - that's my was how forehead looked and felt. I initially put it down to using sunscreen - I wasn't brought up wearing sunscreen at all (you didn't get burnt back then!) but as I get older and I see the signs of ageing, I am becoming more vigilant about sun protection. The often heavy or oily nature of facial sunscreens had always caused pimples in the past so I invested in an expensive, high end facial sunscreen. My forehead spots seemed to appear suddenly around this time but as hard, stubborn little spots rather than actual pimples. Secondary to that, I wondered if hormones were playing a part in these horrible little spots. Things had definitely been different since the birth of our second child. I'd been having some sudden and terrible night sweats, my usually non-existent periods had suddenly become very painful including constant breast pain (which I've since had checked out and all is fine). But I had similar facial spots as a teenager so it made sense that hormones were playing a part. I was very conscious of the little lumps. In the right light I felt they stood out a mile and that everyone was looking at my forehead. I had stopped using any kind makeup on my skin. I was drinking water like a fish in an attempt to help flush out my system and my diet and exercise regime were all great. The skincare routine I had been using for the past 10 years, which had always served me perfectly, was certainly not helping the situation. Something was a miss but nothing was making any difference. Something had to be done. 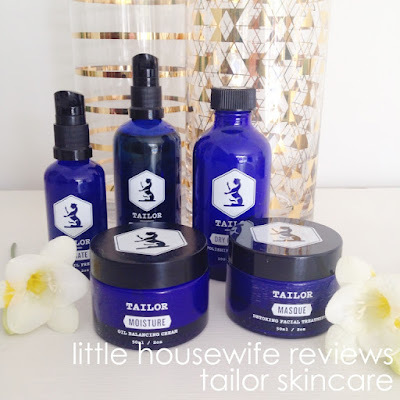 I can't remember what first attracted me to Tailor Skincare - probably their beautiful blue glass packaging knowing me! - but in my on-going quest to make better choices not only for my family and our health but the environment too, everything about Tailors company ethos fits with my beliefs. 3. Animals: Tailor believes animal rights are paramount"
All of the ingredients in Tailor Skincare are either natural or derived from nature and meet the criteria of the Natural Products Certification which require that 95% of a products ingredients (excluding water) to be natural. "The Oxford Dictionary defines natural as "existing in or derived from nature”. This definition is widely accepted by the general public, however when it comes to the context of skincare and personal care products there is currently no regulatory body, nor any globally recognised definition for the term "natural." What this means is that skincare companies can call their products natural even when they contain potentially harmful synthetic ingredients.” It’s up to you to educate yourself by looking past the well designed product label, flipping the bottle over and reading the ingredients list". You can read more about Tailors Ingredients here. I emailed Tailor with all of my skin concerns as I wasn't sure where to start with their range. I received a very professional and in depth response to my inquiry and from their advice purchased some trial size products - which by the way are generous in size and a little goes a long way so you'll get a good feel for the products from the trial kits. The trial kit I purchased included the Oil Cleanse, Dry Cleanse, Moisture, Hydrate and Masque - although there are some other products in the range as well which I am yet to try. 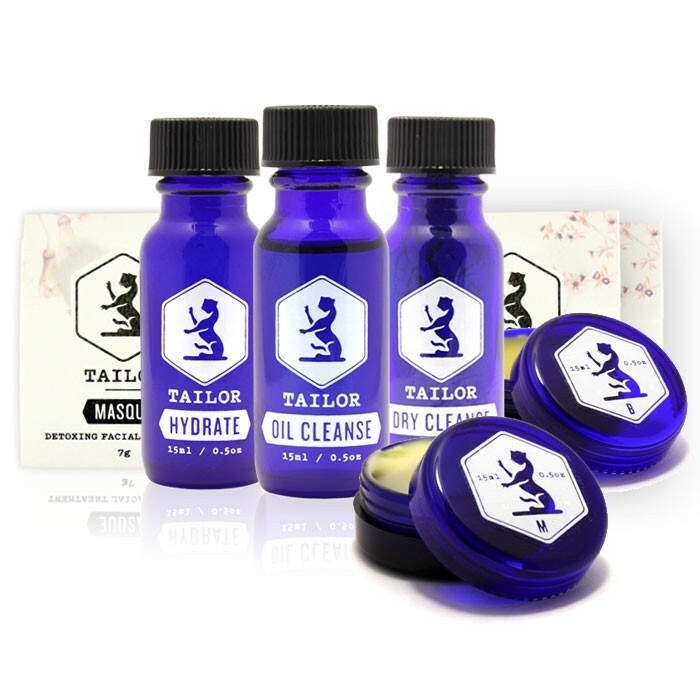 The biggest and most significant change for me in switching to Tailor was the Oil Cleanse. This replaces your face wash. It's not even close to being a "wash" but it will replace that step in your face care routine. As the name suggests, this is an oil that you rub in to your face and then gently wipe off with a clean, warm facecloth. I honestly can't tell you about the overwhelming need I had to lather up with something bubbly and "wash" my face in the first few weeks . It's ingrained in us from a young age that bubbles = clean so putting oil on my face to clean it went against everything that I had been taught. Surely adding oil to my face would make the problem worse. Didn't I want to wash away and remove the oil from my skin? There is a fabulous article here explaining far better than I ever could how the Oil Cleanse works and what it does for your skin. It's fascinating stuff and well worth a read. So, sceptical as I was at first, I persevered on as it couldn't have made my forehead any worse. Formulated with antioxidant rich cold pressed New Zealand grown Hazelnut oil and organic coconut oil, Tailor Oil Cleanse is recommended for use at night before you go to bed and in the morning you simply wipe your face with a clean, warm facecloth*. Tailor Oil Cleanse is also a very effective make up remover so it tackles two jobs in one. The second cleanser is the Tailor Dry Cleanse made from bentonite clay. It's a dry powder which you mix with a few drops of water to make a mildly gritty, clay consistency exfoliator. Tailor are very clear on the importance of regular gentle exfoliation to get rid of the dead skin cells and rejuvenate new skin and I think this is what played a significant part in helping with my skin issues. You can read a great article here by Tailor on the different types of and benefits of exfoliating. Tailors Dry Cleanse is made to be used 2-4 times a week, after the Oil Cleanse. One of my favourite products in the range is the Tailor Moisture. I'm a fan of middle weight consistency moisturisers and this fits the bill perfectly - it's not too heavy or not too light. Made with NZ grown hazelnut, grape seed, blackcurrant seed and kiwi seed oils, I find that my skin simply drinks this in. It leaves behind no oily residue at all and you can apply your make up straight after using. The second moisturiser is called Tailor Hydrate and is a light weight, nutrient rich, oil free gel. Initially I put this product to one side as I loved the Tailor Moisture so much and I have not previously been a fan of light weight moisturisers but I have since started applying it over the top of the Tailor Moisture with pleasing results. A little bit goes a very long way so use sparingly. To be honest, when I started using these products I didn't pay too much attention to the results. I was so used to not seeing any results prior to this that I was in the mind set that I wouldn't see any significant changes. It wasn't until about week two or three of using Tailor that I actually studied my face in the mirror and realised that my forehead was relatively clear. There were still a few small stubborn spots but the majority of the spots were entirely gone. It was then that I started paying major attention to what I was doing and surely enough, each week I noticed small improvements. There also were changes in areas that I didn't expect to see improvement in. I've always had rosie cheeks. Various Doctors had prescribed medicated ointments for rosacea with no success but suddenly my cheeks don't seem anywhere near as red anymore. And my skin is no longer excessively oily. That notorious t-zone seems suddenly calm and relatively oil free. There is no sheen to my skin by the afternoon anymore. I don't have the pristine skin that the Revlon lady admired at lunch a few years ago (yet!) but the improvements have been noticeable, significant and really pleasing. Should my girls experience problem skin in their teens then I will definitely be turning to Tailor to get them through it. I've been really impressed not only by this fabulous range of New Zealand made products but the knowledge, help and resources supplied by the team at Tailor. Their weekly email newsletter is a wealth of knowledge on all matters of mind, body and soul. I am so glad I've made the change and seen such huge improvements in my skin. * These were the instructions and routine recommended for me by Tailor Skincare. You may be recommended slightly different directions of use. 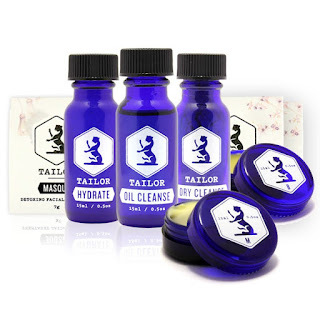 Tailor have very generously given us a set of miniatures including a 15ml oil cleanse, 15ml dry cleanse, 15ml hydrate, 15ml moisture, 15ml balm and three mini masques valued at over $60.00 to giveaway to one lucky winner. For an extra entry comment below on this blog post with which product mentioned above you like the sound of and would like to try. All the products sound fantastic, from the oil cleanse to masque. But I'd particularly be interested in seeing the same results to my grainy sandpaper textured forehead spots, from using the Tailor Masque. Similar to you, my skin issues have arisen post-baby, who is now 3yrs old, but skin has remained the same. what an amazing range of natural skin care products...<3 I would love to try Tailor Masque. I have break out prone skin and this product sounds perfect. Thanks for the chance to win. Tailor sounds idyllic, not only with its natural ingredients but also for its convenience of range. The oil cleanse really interests me. this is a gorgeous post/ review. i take bentonite clay internally, but to hear that it is useful, externally, at unclogging pores is wonderful news. 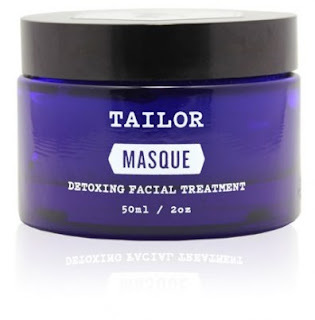 i would be absolutely over the moon if i got to sample the Tailor Masque from this giveaway. my skin certainly needs some deep unclogging. I'm yet to find my perfect moisturiser so i'd love to give Tailor Moisture a try!